Menulog delivers for Rice Workshop - Northland so you'll be able to track your courier on a map. Seaweed with vinegar and soy sauce. Traditional Japanese soup contains seaweed. Assortment of vegetables wrapped in a thin and crunchy pastry. Our version of a vegetable potato croquette. Golden fried vegetables and creamy crab meat croquette. Japanese style deep fried breaded chicken pieces. Savory pancake ball made with octopus and shallots. Grilled tofu steak with teriyaki sauce. Tender succulent chicken wings with choice of flavour. Grilled tofu and mushroom with vegetable croquette, vegetable gyoza, edamame, seaweed salad, corn and rice. Battered fish with mayo and yakitori (skewered chicken), scallop, gyoza, seaweed salad, corn and rice. Unagi (Japanese eel) with yakitori (skewered chicken), scallop, gyoza, seaweed salad, corn and rice. Pork katsu with yakitori (skewered chicken), scallop, gyoza, seaweed salad, corn and rice. Chicken katsu with yakitori (skewered chicken), scallop, gyoza, seaweed salad, corn and rice. Grilled salmon with yakitori (skewered chicken), scallop, gyoza, seaweed salad, corn and rice. Angus beef with yakitori (skewered chicken), scallop, gyoza, seaweed salad, corn and rice. Slow cooked beef and onion stew in a soya broth of herbs and spices and curry on rice or udon noodles. Char-grilled chicken and curry on rice or udon noodles. Crunchy battered chicken pieces and curry on rice or udon noodles. 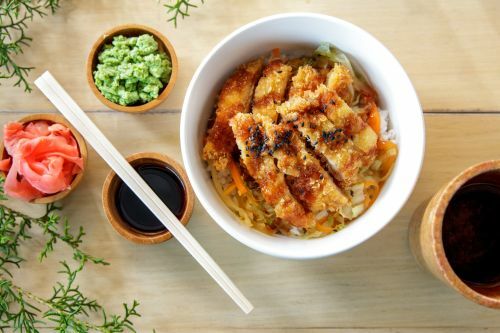 Crumbed chicken fillet and curry on rice or udon noodles. Char grilled tofu and curry on rice or udon noodles. Crumbed pork fillet and curry on rice or udon noodles. Spicy ox tongue on rice. Char grilled chicken with teriyaki sauce on rice. Char grilled chicken with spicy mayo and teriyaki sauce on rice. Char grilled chicken with teriyaki sauce and egg on rice. Slow cooked beef and onion stew in soya broth of herbs and spices on rice. Slow cooked beef and onion stew in soya broth of herbs and spices and egg on rice. Slow cooked beef and onion stew in a soya broth of herbs and spices with fermented spicy vegetables on rice. Deep fried crunchy salmon bites and spicy mayo on rice. Grilled teriyaki salmon on rice. Crumbed deep fried chicken, mayo and katsu sauce on rice. Crunchy battered chicken pieces and spicy mayo on rice. Crunchy battered chicken pieces and spicy miso garlic sauce on rice. Char grilled tofu glazed in teriyaki sauce on rice. Crumbed deep fried pork, mayo and katsu sauce on rice. Grilled unagi and teriyaki sauce on rice. Slow cooked beef and onion stew in a soya broth of herbs and spices and noodle soup. Two fried tempura prawns and noodle soup. Tempura vegetable pancake and noodle soup. Fresh seasonal vegetables and noodle soup. Char grilled chicken, teriyaki sauce and noodle soup. Tempura prawns, tempura vegetable pancake and noodle soup. Sliced BBQ pork noodle soup. Crumbed deep fried chicken noodle soup. Crunchy battered chicken pieces noodle soup. Char grilled tofu and mushroom noodle soup. Fresh seasonal veggies noodle soup. Choice of flavour: cherry blossom, tiramisu, green tea or black sesame. Japanese pancake with red bean.